Are you a poker enthusiast dreaming of hosting poker-perfect weekends with close friends? If you are, then you are not alone in this dream. An in-house poker session with family and friends is a great way to bond together, catch up and perhaps to make a little money on the side. To aid you in the last and most important item mentioned above, we have listed below 5 of the best poker chips to die for. The brands below vary depending on materials, style, chip amount and cost. Take a look at the list and you might find what poker chip brand might suit your poker-perfect rendezvous. This lightweight poker chip set is produced from a composite resin for that true casino-quality look and feel. With the manufacturer’s hot stamp capabilities, orders can be customized based on your specifications. The best part is that each chip is adorned with the “Holdem Poker” design. Distributed by Trademark Poker, priced at $119.99/set. The 300-piece diamond suited chips (each weighing approximately 11.5 gr) are made from ABS composite materials with metal core. 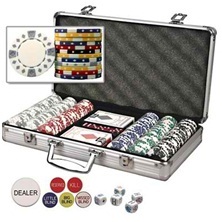 Lightweight and colorful, the package also comes with a stylish aluminum chip capacity case, 2 decks of cards, 6 dealer button package and 5 poker dice. From Da Vinci Imports, priced at $131.80/set. From the renowned playing card brand since 1885 comes this quality poker chip set that is a “must have” collection for poker aficionados. The set includes 300 pieces of 2-toned clay-filled chips and two premium Bicycle-branded playing card decks. The set is encased in a classy wooden lacquered box for that premium-look Bicycle is known for. Each set is priced at $49.99. Play like a pro with this 1000-chip poker set from Bluff King. 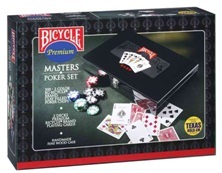 Priced at $149.99, the set comes with chips in various denominations, lightweight aluminum casing, 4 decks of playing cards, 6 dealer button, 5 poker dice and 5 red dice. 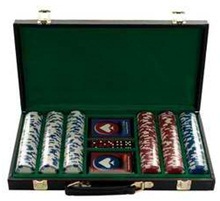 These pro-like chip set are manufactured from high quality clay material for that casino-quality impression. The 400-piece, perfectly rounded chips can be personalized based on buyer’s specifications. 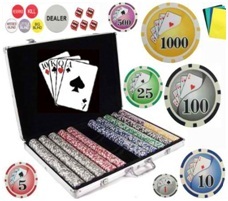 Set includes 1 aluminum case, 2 decks of playing cards, 5 red casino dice and 1 dealer button. Priced at $43.95, each set comes with the Tournament Pro logo for that true professional playing experience at home. So, what you waiting for? Which of the best poker chips are you planning to buy?